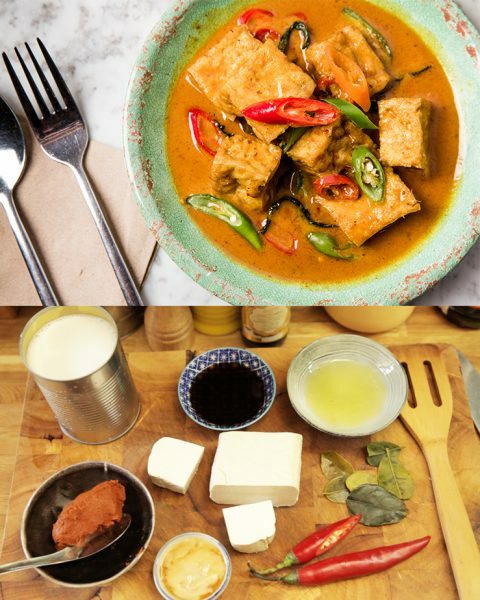 Panang curry is definitely a dish for Thai Cooking 101. It’s one of the easiest curries to learn. Since there aren’t a lot of ingredients, the chance of things going wrong is quite low! Traditionally served with chicken or pork, we’ve given it a veggie twist and used firm tofu instead so everyone can enjoy this dish. But if you aren’t in the mood to cook it yourself, come try this dish at our Rosa’s Thai Veggie pop-up at our Dean Street branch (until April 15th). Heat the oil in a saucepan over a high heat. Add the curry paste and stir-fry for a few seconds until fragrant. Be careful, the paste might spit! Pour in the coconut milk and bring to the boil, then reduce the heat to medium and cook, stirring occasionally, until the red oil rises to the surface. This might take about 4-5 minutes. Add the tofu, soy sauce and palm sugar. Stir until palm sugar is completely dissolved. Continue to cook on medium heat until tofu is cooked through. About 3-4 minutes. Turn off the heat and add the lime leaves and chillies. Best served hot with steamed rice.